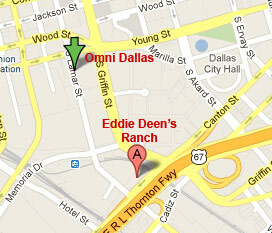 Perfect for Convention Groups from the Dallas Convention Center! We make hosting events easy, with event specialists on staff to help you with entertainment options, nationally known Eddie Deen catering (don’t forget our signature BBQ sauce), and most importantly peace of mind. With downtown Dallas as our backdrop, we are excited to see the addition to Dallas' skyline with the 23-story Dallas Convention Center OMNI Hotel. The Dallas Convention Center is one of the largest convention spaces in the nation and this is an exciting time for our community. Our convenient locations along with an array of spectacular services allow us to set the perfect stage for your next special event. A True Texas experience your guests will never forget! If you are looking for a Texas-style venue that will provide Texas-sized entertainment for your group look no further! We have great options for convention groups, big or small. From facility to menu to entertainment, let us take care of making your event unforgettable! Click here for a printable version of this page.